Cold brewing works by steeping coarse coffee grounds in cold water for up to 24 hours before filtering. There’s no heating or electricity required, just time… and patience. Cold water extracts much less acid from the bean than brewing with hot water, producing a delicious, low-acidity drink which is naturally slightly sweet. So sweet, in fact, that our in-house tasting session prompted at least one drinker to put down the spoon and step away from the sugar jar – perfect if you find the taste of ‘normal’ coffee just too bitter. But what gets coffee-lovers really excited about cold brewing is the way it brings subtle flavours to the fore. 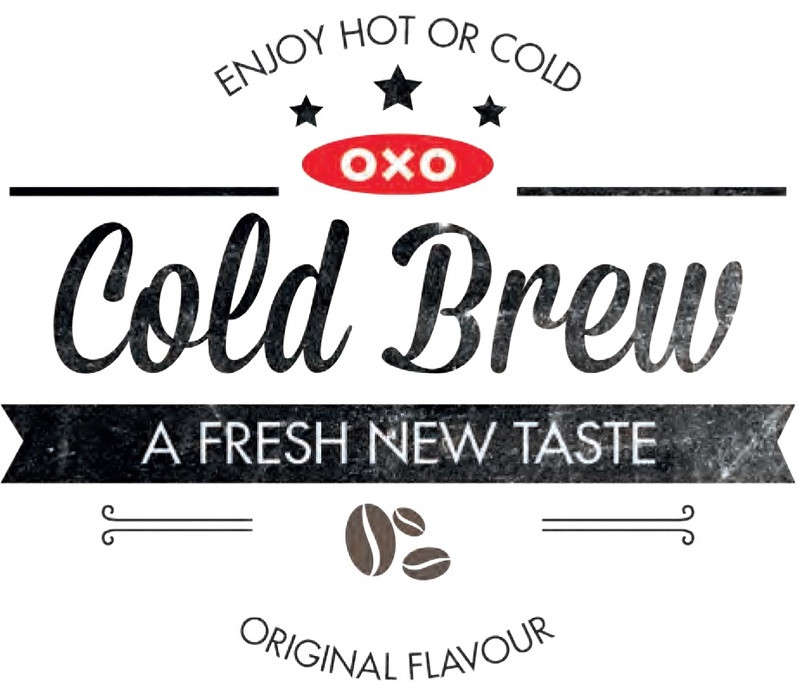 Nutty Brazilian, caramel-tinged Colombian, smoky Sumatran, tartly tropical Kenyan: if you’re a fan of flavour, cold brew’s for you. How do I use it once I’ve made it? Probably the best way to think of the resulting coffee is as a prepared concentrate or base, a little like cold espresso. Stored in the fridge, it will keep fresh for up to a fortnight, so the 12-14 ‘shots’ made in a single brew could supply your morning coffee for two weeks – just add hot water or milk to make Americano, lungo, cappuccino or latte, or serve cold over ice. And if you’re a baker as well as a barista, it also makes great coffee essence for cakes and icing. 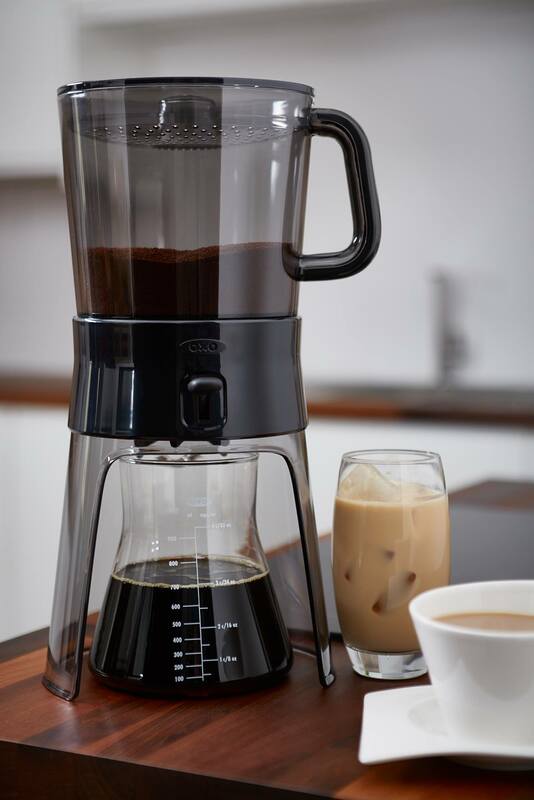 We chose this Good Grips model as our first cold brew coffee maker because, as you’d expect from OXO, it’s been carefully designed to be incredibly simple to use – and the resulting brew tastes fantastic too. The unique ‘Rainmaker’ at the top distributes water evenly, extracting the maximum amount of flavour from the grounds, and the ultra-fine stainless steel mesh filter keeps them out of your brew. When you’re ready to start filtering, just flip the switch on the front – a clever auto-stop function halts the process when the carafe below is removed, preventing any coffee puddles on your countertop. Once your brew is done, the silicone-sealed stopper caps off the carafe to help keep your coffee fresh in the fridge, and graduations on the side help you measure out exactly how much you want. The filter can be removed for cleaning, the glass carafe is dishwasher safe and it all nests neatly together for storage. A single brew makes enough for 12-14 drinks. Ready, Steady, Spiralize!Successful baking made easy!